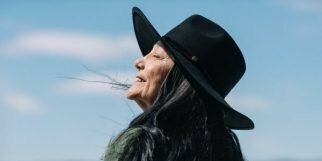 Tantoo Cardinal stars as Mary, a renowned Anishinaabe musician who returns to Atikameksheng Anishnawbek First Nation in northern Ontario to rest and recharge — only to discover that fame and the outside world are not easily left behind. Urged by her sister, Betty (Tina Keeper), to reconnect with friends and family, Mary soon discovers the possibilities of her new life. However, the past has a way of catching up, and when Mary begins to hear disturbing noises around her cabin, she becomes paranoid that someone may be after her. A survivor by nature, Mary chooses to thrive in her environment and allows herself to be healed by love, community, and, especially, the land.